The Week 16 schedule opens up with the Tennessee Titans taking on the Jacksonville Jaguars in the final Thursday night game of the 2014 NFL season. With only two weeks remaining in the regular season, it’s now or never for your football office pool. Get a printable NFL Pick Em Week 16 sheet and make your final push. The pick em sheet is instantly downloadable and free here at Printablebrackets.net. The season finale of “Thursday Night Football” features a meeting of AFC South foes. The two teams split the regular season series in 2013, with each winning on the other’s home field. The Jags earned a 29-27 win in Tennessee in Week 10, while the Titans exacted revenge in Week 16 with a 20-16 win in Jacksonville. Entering the 2014 season, the teams have split the last 10 regular season meetings dating back to 2009. 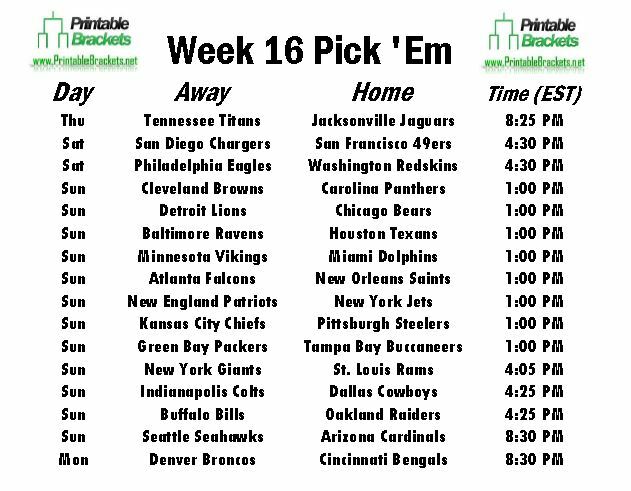 Meanwhile, the NFL pick em Week 16 sheet features a pair of Saturday games for the first and only time all season. The San Diego Chargers will be on the road to clash with the San Francisco 49ers, while the Philadelphia Eagles will tangle with Washington Redskins. There are seven early Sunday games on the NFL pick em Week 16 sheet. The early slate is headlined by an AFC East battle between the New England Patriots and New York Jets. Divisional foes will also lock up when the Chicago Bears host the Detroit Lions. In late action on the NFL pick em Week 16 sheet, Tony Romo and the Dallas Cowboys will host Andrew Luck and the Indianapolis Colts. The New York Giants will also square off with the Rams in St. Louis. On “Sunday Night Football”, the Seattle Seahawks will hit the road to collide with the Arizona Cardinals. Week 16 wraps up with the Cincinnati Bengals hosting the Denver Broncos in the final Monday night matchup of the year.